In the old days of the web, search engines used meta description text when ranking pages for queries. In fact, the Chinese search engine Baidu still does. In modern SEO, however, it's clear that this is no longer the case. So what role do meta descriptions play in SEO today? What Are Meta Descriptions and Do They Matter? Meta descriptions are HTML tags that appear in the head section of a web page. The content within the tag provides a description of what the page and its content are about. In the context of SEO, meta descriptions should be around 160 characters long. What do meta descriptions do? Google uses meta descriptions when displaying a page in search results. It combines the description, page title and URL to from a page's search snippet. Remember that the content in your description tag is really just a suggestion for Google. Google will display content in the snippet that it thinks is most relevant and useful to the user's search intent based on their query. Sometimes that means your meta description, sometimes that means parts of your page content. How Do I Use Meta Descriptions for SEO? Meta descriptions don’t directly impact a page’s ranking in search results, but they can still have a big effect on SEO. Google does rely on descriptions a bit to determine a page’s relevance to a query. However, the biggest role they play is encouraging click-through and dwell time for users. Since meta descriptions are often incorporated into the search snippet, it’s the first interaction a person will have with your page and is your opportunity to encourage them to click the link to your page. Think of your search snippet as a digital billboard for your site. They entice users to click through to your site and, depending on whether or not user experience matches expectations set in the descriptions, helps keep them there. Keywords: Google bolds words in meta descriptions that match the words used in a user's query. Using keywords in your meta descriptions will reinforce to users that your content has the information they're searching for and help draw attention to your snippet. Communicate your value: Think of it as writing copy for an organic search text ad. Use engaging, descriptive copy to entice users to click through to your site. For non-commercial queries, answer the targeted question in the description so it will appear in the SERP. Note: If you’re optimizing pages for conversions, or otherwise targeting in-market users, consider using words like “deals”, “cheap” or “free shipping” to encourage clicks. It may look spammy to you but it will actually help. Just make sure you actually offer the deals you’re advertising. Use actionable language: Use content that's designed to encourage users to click. That doesn't necessarily mean adding "click here now" to your description, but rather describe the goal the user will achieve. Something like "learn what meta descriptions are, why they matter and how to use them" or "buy the best wind-proof umbrella". A well-written meta description will tell a person what a page is about and what they'll get on it before they click. Improving your page's CTR is helpful, but not as helpful if all that new traffic thinks they're clicking on a page for something else. So while your meta descriptions need to be compelling and actionable, they must also be accurate. If you don't offer free shipping or special discounts or if your content doesn't answer a certain question, don't claim otherwise in your descriptions. Plus, if you lie to your users, they'll not only leave your page quickly, they'll probably lose trust in you and never come back. Plus, if Google thinks your meta description doesn't accurately represent the page content or isn't relevant to a query, it will just replace your description with its own in the snippet. So creating accurate descriptions make it more likely Google will choose the one you want. Changing meta descriptions will differ based on the content management system you use. Since WordPress is currently used for just about 25% of all websites on the Web, we’ll go over how to change the meta descriptions for your pages using this CMS. By default, WordPress does not include meta tags on your website. The reason for this is that each meta description will be unique, meaning every meta description tag will be different. A plugin (the Yoast SEO plugin is an excellent one). This is recommended. Edit the header.php template file in your WordPress Theme. Create a new Page or Post on your website. Write your description in the meta description field. Optimize your meta descriptions using keywords according to SEO best practices. It is possible to add meta descriptions to your WordPress site without using a plugin. However, it’s not recommended because this method does not allow you to customize meta descriptions for each page, an issue that could be flagged by search engines as duplicate content. For this reason, we don’t recommend using this method for adding meta descriptions to your WordPress site. There’s one more reason you should put effort into your meta descriptions: social media. 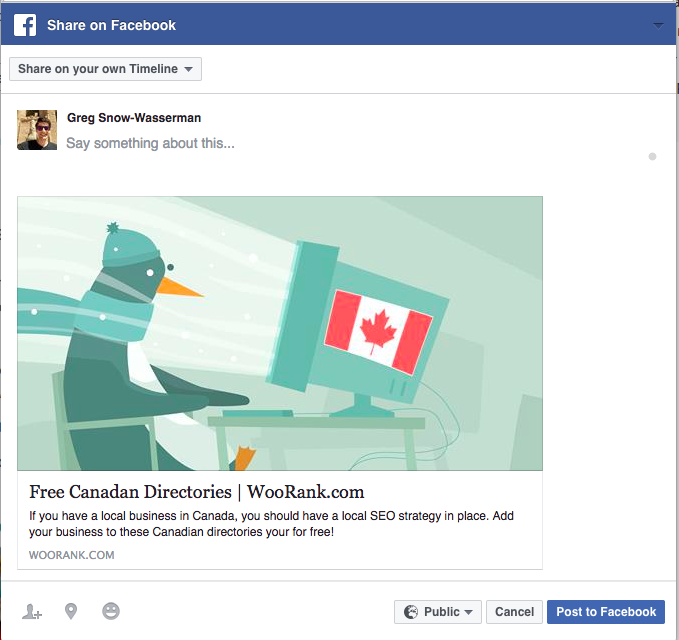 Most social media platforms use the title tag and meta descriptions when displaying pages shared by users. This won’t really impact your ranking, but good meta descriptions can drive user engagement and visits to your website, just like in search results. So, as you can see, writing a good meta description for your pages will help improve traffic across multiple marketing channels and improve your on-page user behaviors.